I have to come clean and admit that ramen doesn't really float my boat. All the new ramen joints that have emerged in central London over the last year have been great for variety (and of the bunch, Shoryu's yuzu tonkotsu is my favourite), but mainly I yearn for cleansing noodles from Koya - if only the queues were shorter! For me though, soba noodles are where it's at. My first trip to Tokyo coincided with New Years Eve and the local tradition is to eat soba noodles at midnight. For some reason this left an impression on me. So on my recent return to Tokyo, ramen didn't feature on my must-eat list at all. I wanted to try more soba and udon. Happily, when consulting the sages of Twitter, I came across Sarashina Horii, a soba noodle specialist with a history dating back 220 years. Sarashina Horii is nestled on a quiet street down the hill from the thriving expat community in Roppongi (although the closest metro station is Azabu-juban). Don't be put off by the location under a nondescript apartment block, the "menu in English" sign and the plastic versions of food in a display cabinet outside, because inside you will find a particularly Japanese experience. I was impressed by the various seating options, including a large section devoted to low tables atop tatami mats, but Mr B and I shared a regular table with a Japanese couple. Actually, we were the only non-Japanese in the restaurant, which was filled with various generations of locals slurping with gusto while we inexpertly inhaled our noodles. It's a harder manoeuvre to perfect than it looks, and I definitely need more practice. We went for an early Sunday lunch after a brief look around Roppongi Hills and by 12.30pm the place was full and a small queue had formed. The extensive English menu is a saviour if your Japanese language skills aren't up to scratch (like mine), because there are more than two dozen noodle options (both hot and cold), plus various side dishes to choose from. The up-to-date web site is also pretty good if you want to navigate your options before eating too. As a bonus, there were also some staff who could speak English. We started with a simmered pork dish and ordered the two seasonal soba dishes - one with wakame and fresh strips of fresh bamboo and the other with spanking fresh little neck clams. We were also given a refreshingly good cold tea. The simmered pork belly served in a puddle of soy-based broth was a tender hunk of fatty, rich and delicious meat served with a small blob of Japanese mustard. The meat yielded easily to the chopsticks giving a great ratio of meat to melting fat. After a few bites, we mixed the mustard in with the remaining hot liquid to give it a bit more punch. I can't describe how good this was. I would go as far as saying that this pork dish was one of best things I ate on my all-too-short trip to Tokyo. The bowl of soba with crunchy hunks of fresh bamboo that followed was delicious. Sitting in a light bonito-based broth, the buckwheat noodles were expertly cooked with just enough bite to them. A generous helping of wakame added texture and colour. It was served with a small bowl of finely sliced leek to add that extra bit of warmth. The other seasonal noodle dish with the fresh clams had a broth with a slightly different flavour and came with grated ginger and another variety of seaweed. Again, a healthy and comforting bowl. With a no reservations policy and a queue of eager noodlers eyeing up the table, Sarashina Horii is not really a place to linger, so grab the bill, which is left discretely on your table, and head up to the counter to pay (it's cash only and won't break the bank). After lunch you might want to wander over to the impressive Zojo-ji Buddhist temple or head to the Tokyo Tower, both of which are easily walkable in about 15-20 minutes. A belly full of pork and warm noodles will definitely set you up for the afternoon. I need to up my productivity! Definitely check these guys out. It was simple but really enjoyable. Thanks for this. Going to Tokyo in a month, so I'm starting my eating planning - the most important planning! I first saw this place on Anthony Bourdain's No Reservations Tokyo episode, and they got the cold soba noodles that you dip in a cup of broth. Did you or anyone at your table get these? No, we didn't have the cold soba noodles at this spot, but have eaten them elsewhere. 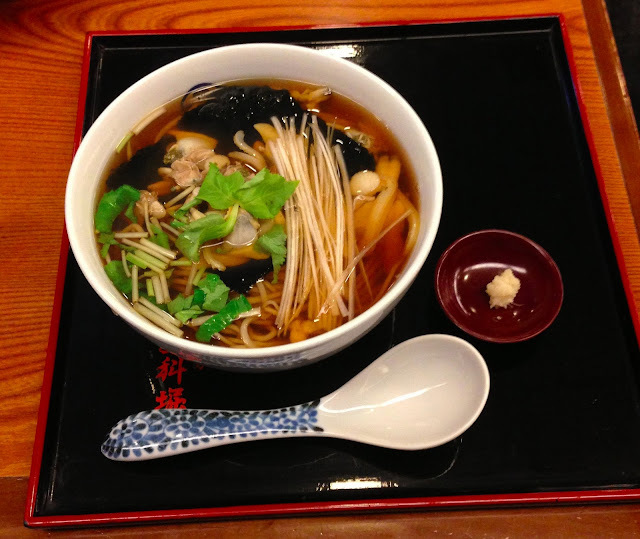 I tend to prefer the cold soba in summer, and we visited in the early Spring. Hope you enjoy your Tokyo trip - there are a few other posts on Tokyo on my blog that I hope you find useful! thank you for such a helpful post. do I need to book for the table? I see. thank you for replying :) I can not wait to visit there very soon!